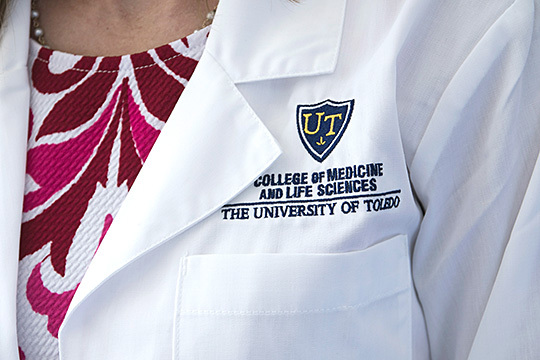 The University of Toledo College of Medicine and Life Sciences will recognize first-year medical students during its official white coat ceremony Thursday, Aug. 2, at 10 a.m. in Nitschke Auditorium. The ceremony, held during the week of orientation, welcomes medical students to the college and prepares them for undertaking a medical career. Highlights of the event include a welcome from the dean of the college, a keynote address on humanism in medicine, and the presentation of white coats and recitation of the Medical Student Pledge of Ethics. Dr. Christopher Cooper, executive vice president of clinical affairs and dean of the College of Medicine and Life Sciences, will officiate the ceremony in which 175 medical students will receive their white coats. Nearly 75 percent of the new students are Ohio residents, and more than 30 percent are from northwest Ohio. In addition, nearly 10 percent of the class studied at UT: A quarter of the incoming students have master’s degrees half of which are from the University. The annual ceremony will conclude orientation week for the medical students. The event can be watch live here. In addition to College of Medicine and Life Sciences, the UT College of Pharmacy and Pharmaceutical Sciences holds a white coat ceremony for third-year PharmD students, and the UT College of Health and Human Services presents white coats to first-year physical therapy and occupational therapy doctoral students and respiratory care students in their junior year, which is the first year of their professional program. And the College of Nursing has a white coat ceremony for students in the Bachelor of Science in Nursing Program and the Clinical Nursing Leader Program. This entry was posted on Monday, July 30th, 2018 at 3:52 am and is filed under Events, Health and Human Services, Medicine and Life Sciences, Nursing, Pharmacy and Pharmaceutical Sciences, UToday .